It’s Time We Talked About Your Diet! Can diet help with anxiety and depression? Absolutely! You know by now that I am a big advocate for self-care for highly sensitive people but you may not know that I have been moving (personally) toward a different way of eating for years now. This year my yearly checkup showed bloodwork indicating my cholesterol levels were fine but my triglycerides were way elevated (this has been the norm for years) but since I was able to see a difference in my overall cholesterol decreasing I thought that I must be doing some things right (I made some changes last year; namely, reduced intake of grains and sugars). This year (essentially the last two months) I have switched to the Ketogenic way of eating. Before you say “fad!” and tune me out please understand that I don’t do fads nor do I do things lightly. As we know, getting quality sleep is essential to good mental health. I now sleep much deeper and for a longer period each night before waking to roll over. Before, I was tossing and turning often and never entering really deep sleep; sleeping more deeply and entering such states more easily is a major benefit and HUGE for anyone with depression and/or anxiety. The other huge change has been in reduced inflammation throughout my body as I ceased consuming sugars and grains. I NEVER would have thought there would be such a pronounced change by just altering the way I eat! I feel as if I have been moving toward a Keto way of eating for years without particularly being aware of it as I cut down on sugars, limited bread consumption, and was more careful about foods but now, by being very explicit about what I’m doing and having seen immediate benefits from it, I am convinced and plan to continue long-term. Ironically, there is not much that’s special that you need to do to embrace a Keto way of eating. Just change what you eat to some degree (depending on your current diet) and start watching the ingredients in everything you buy. That part is harder but worth the effort to avoid the many hidden sugars and junk added to our food (it’s disheartening how many susbtances that act just like sugar in the body are snuck in on us). I have nothing to sell you my fellow HSPs, but I do desire that you be well and live as well as you can. The video below by Dr. Berry is a great introduction to the Ketogenic diet (or way of eating). His short videos are great because he bases his comments largely on his empirical experiences and on research (especially metastudies, which, as we know, are studies of studies). Be mindful of other speakers out there espousing views that diverge from the research or that ask you to buy something they happen to produce and sell. Dr. Berry is a medical doctor in family practice in Tennessee seeing patients on a daily basis. For those of us who experience depression and anxiety, I feel that addressing our diet in a serious way is essential to calming the body and mind. Isn’t it time as grown adults that we put away the childish food choices that are slowly killing us and exacerbating our depression and anxiety? To be an adult implies that we make adult choices; no choice could be more important than our health because it is so initmately intertwined with our functioning in the world. If you need to make changes in your diet I heartily recommend the Ketogenic diet (or way of eating because it is simply the way humans are suited to eat). Plant based diets may also be workable for those who are opposed to the consumption of meat or dairy. Whatever you do, consider giving up the highly processed foods, the sugars, the grains, and the carbohydrates and see if it makes a difference in how you feel and experience this life. Please feel free to share in your social media circles. Dr. Tracy Cooper is the author of Thrive: The Highly Sensitive Person and Career and Thrill: The High Sensation Seeking Highly Sensitive Person. Dr. Cooper provides one on one consulting to HSPs in career crisis or transition through his website at drtracycooper.com. Depth of processing of all experience and stimulation – we process everything that happens in a more elaborate way in our minds. Overstimulation to certain, highly individualized types of stimulation – some HSPs feel overstimulated/irritated by certain noises, smells, types of fabrics, social situations. It is crucial here to note that we must refrain from homogenizing all HSPs as one group. What bothers one may not register with another as an issue. Some HSPs have largely learned to ignore overstimulation in fact. Emotional responsiveness and High empathy – highly sensitive people have a broader possible range of emotional expression than in those without the trait. This more expansive range is akin to looking at a rainbow after a storm where we typically see red, blue, green, yellow, maybe some violet; with HSPs the colors of our emotional range include every variation in between: red-violet, blue-violet, yellow, orange, red-orange, etc. Because of this greater possible range of emotions, we typically spend much more time processing those emotions, which are often intense emotions meaning we also spend a goo deal of time in self-care and boundary setting/monitoring to avoid overstimulation. Highly sensitive people are also typically high in empathy, meaning we may readily enter the experiences of other people and see the world from their viewpoints. Again, it is essential to not lump all HSPs together as a supremely empathetic group of saints and healers; there are HSPs who may be quite dysfunctional, angry, violent, and manipulative. By acknowledging that we HSPs comprise a cross-section of vastly differing types of people we allow for that diversity to exist and resist the all too human urge/need to group what we perceive as like things together, when, in fact, they are only somewhat alike. Sensitivity to subtleties – highly sensitive people tend to pick up on subtle details others overlook or miss entirely. One study found that those with Sensory Processing Sensitivity spent more time studying visual scenes when asked to examine photos. We are also, obviously, more sensitive to smells, sounds, and energetic forces around us. However, this does not mean HSPs have “super” anything; we simply process the stimulation of a subtle smell more elaborately and with greater emotional activation. Historically, this may have had great benefit; simply imagine being able to pick up on a slight foul odor from food a group was about to eat, or a slight rustle in the leaves could have indicated a predator about (four and two legged). Sensory Processing Sensitivity is a personality trait (like all traits) that developed as a result of a need for such a trait in survival circumstances. A trait need not have provided a vast advantage to remain in the genome; simply a slight advantage in terms of survival and reproduction would have worked well enough to cause it to pass down in the population. On average, if SPS provided a survival advantage it simply continued. The process of natural selection, in its sieving process, would have retained SPS as a useful trait. SPS is till around today (in fact, Sensory Processing Sensitivity has been with us for perhaps a million years or more) because we still face dangers of all types and SPS still provides that advantage, though now its utility to groups is less evident since our society is so highly individualized and dominated by a preference for extreme extraversion. Those who are capable of thinking more deeply; who are creative (capable of generating alternatives, options, and divergent possibilities and directions); and who are meticulous in planning and execution are, ironically, less valued, in many circumstances than they perhaps should be. This situation is no more evident than in the workplace, where we spend such a great deal of our time, energy, and life force. The titanic task of evaluating and explicating the modern workplace and how highly sensitive people experience it was the focus of the study underpinning Thrive. Through following strict research protocols and semi-structured interviews, I was able to glean the experiences of a sample of our population. When conducting interviews there is a point that arises where the people being interviewed begin to repeat themselves. Once the point happens (and this line is different in every study) where they are basically saying similar things the researcher knows he has reached a saturation point. That number was 35 in this particular study. Some people less familiar with the way scientific research is conducted might say,” why not interview 500 people?” That’s not how research is done; at some point we have our representative sample, and typically a wealth of information to work with, and must move on to analysis and interpretation. Thrive, however, goes farther than one study; it also contains the results of a large survey given to HSPs numbering over 1,500 people. In that survey, people were asked questions derived from the interviews to better understand if what I had been told in the interviews applied across a wider range of random HSPs. I also took the opportunity to have HSPs take a sensation seeking questionnaire to determine how many high sensation seekers were in the group of survey-takers. This was of special interest (and could have skewed the results) if a disproportionate number of high sensation seekers were also the survey-takers. As it turns out, the number was about roughly the same as was previously surmised (about one third). Thrive: The Highly Sensitive Person and CareerThrive: The Highly Sensitive Person and Career examines the issue of work and career from many angles (as you might expect being written by an HSP). Perhaps that is what separates Thrive from other books and articles written on the topic of career; it is a book written for HSPs by an HSP. My experiences with career and the workplace have been varied and always deeply impacted by my sensitivity. My journey to find greater meaning in a career, greater autonomy, working conditions that are conducive to allowing me to function at my best, and work that meshed with my need to be a servant-leader all propelled the writing of Thrive. You might expect such a book to be filled with ultimate answers to your dilemma regarding career but, in truth, the best any researcher or author can hope for is to shine the light of illumination on the subject, thereby enabling you to forge ahead on your unique path. I do not know what the best answer is for your career issues because each of us is quite different. If I were to talk with you for an hour and learn about your life, goals, and passions, I would have a good idea about specific recommendations but not knowing that information authors must write in certain general terms and trust that deep-thinking HSPs will reflect on the information presented in service to their current situations. I do provide one on one consulting to HSPs regarding career, and regarding the high sensation seeking highly sensitive person (drtracycooper.com/consulting) but Thrive is a very good broad-based survey of the topic of HSPs and career that anyone seriously interested in understanding the myriad of issues HSPs face with regards to career will find useful and informative. Thrive is something else too: it is flexible and will be updated about every five years to address the changing economy and workforce. Thrive is a commitment by me to continue learning, studying, and researching so I can bring you the best possible advice for that time period. Unlike traditional books by traditional publishers where books are written for sensational value (to get you to buy a lot of copies in a short time) Thrive is fully integrated with a number of print on demand platforms where copies are only produced as customers buy them. In this way, I am not out to sell a million copies all at once; I can patiently allow Thrive to make its way throughout the HSP communities on social media and otherwise through word of mouth. One buys a book of this nature, and with the long-term vision of its author, because it will be a valuable asset to an overall library of material related to Sensory Processing Sensitivity. As lifelong learners (and I very much believe that is what we HSPs best embody), we will have many books on our bookshelves. Few are the type of sensationalism, poor science, or outright “fluff” that fill too many books aimed at HSPs. Thrive: The Highly Sensitive Person and Career is one book you will read and reread over the years as you reflect on the narratives presented, the scientific data, and the opportunities for greater self-awareness and action in the world contained in its covers. Do you experience strong, quick emotions that override your rational thought processes? Of course you do if you are a highly sensitive person; that’s how Sensory Processing Sensitvity works! What can we do to develop greater awareness and control of our emotions and their effects on our critical thinking abilities? In the following article by Benard Golden, PhD, learn more about how we resort to using “child logic” when we allow our emotions to dominate our thinking. How is it that you fully know not everyone drives with caution and consideration, but you still expect them to do so? How come you still expect your spouse to be frugal when shopping, even though ten years of history together tells you otherwise? And, what causes you to rigidly expect perfection from yourself, when being human means we make mistakes, have weaknesses and suffer. The answer to each of these questions lies in “child logic”–a term that I have coined to describe logic that is hijacked by emotion. I use this term without any attempt at disparagement. Rather, it emphasizes that regardless of age or intelligence, we at times engage in magical thinking associated with earlier development. Such logic fuels unrealistic expectations and heightens the potential for destructive anger. It’s as if the emotional brain and the rational brain are not effectively communicating with each other. Whether emotions override logic or the rational brain is ill prepared to correct the surge of emotion. The result is impaired judgment. As someone who has spent years studying anger and helping people constructively manage it, I’ve seen the destructive impact of expectations sustained by such reasoning. All of us are guilty of this mental distortion, some more than others. Anger stems from feeling threat and some form of inner pain, such as fear, anxiety, shame, hopelessness and powerlessness. It’s understandable that we might have some degree of irritation aroused by that driver who abruptly cuts us off. Similarly, we may feel our financial security threatened by our partner’s lack of frugality. And certainly, we may be disappointed with ourselves when we fail to achieve our goals. But the inability to be realistic in our expectations makes all the difference between having feelings such as disappointment and sadness, and experiencing intense anger. All too often, child-logic infuses our expectations with emotions rooted in our wishes and hopes, insufficiently tamed by the facts of reality. It is child logic that supports beliefs such as: “Life should be fair”–when “Life just is”; that good efforts should always yield rewards–when they sometimes don’t; and that we should be able to control all aspects of our lives. In effect, it is child logic that may at times convince us we should always get what we want, that others should act as we believe they should, and that we should not have to suffer–even though all of us suffer. The impact of child logic is similarly prevalent in the current electoral cycle. Individuals in each party exhibit intense anger and resentment toward opposing candidates. Additionally, others experience anger toward the candidate selected by their own party. There are certainly valid reasons for the electorate to experience anger with regard to income inequality, racial injustice, threats of terrorism and deficiencies in government. Understandably these events create a sense of threat and other forms of inner anguish that might include fear, anxiety, powerlessness and hopelessness. However, rigidly maintaining unrealistic expectations only intensifies the potential for destructive anger–when they are not satisfied. Unwittingly, like partners in a marriage that has soured, many people are challenged to look beyond their own immediate interests. The intensity of anger and how it is expressed rests, in part, on the fact that some of the electorate know compromise is essential for a democracy–yet feel it shouldn’t be the case. And yet, maintaining this expectation is inconsistent with a functioning democratic government. Letting go of unrealistic expectations doesn’t mean the passive acceptance of what is. It may involve recognizing that certain expectations are aspirational rather than attainable. Or, letting go can free us to consider alternative strategies for increasing the likelihood of their satisfaction. Developing more realistic expectations in our daily lives calls for pausing for reflection. It necessitates being aware of when we are too rigidly holding on to them in spite of a reality that reminds us they cannot be satisfied. It requires that we distinguish between what we really need and what we desire. And, all too often, it demands awareness of how anger can interfere with the willingness to engage in such reflection. The capacity to recognize when child logic influences our expectations is essential for developing resilience, a key component of well-being. Resilience is a strength that allows us to bounce back from adverse consequences. It consists of recognizing when our expectations are overly influenced by hopes and wishes. Resilience very much depends on the flexibility of thought to let go of certain expectations, when we recognize we have no control over satisfying them. Certainly, this is not always an easy task. It involves grieving and mourning, dealing with a sense of loss that often moves us to sadness and disappointment instead of anger. Some suggest that not having expectations is the only way to avoid disappointment. However, this attitude seems to be both pessimistic and a denial of a very human tendency. Rather, the real threat posed by maintaining expectations is when we cling to them and when they are overly influenced by child logic. The challenge for each of us is to be mindful when this occurs, as these two conditions form the bedrock of destructive anger. Bernard Golden, Ph.D., is the founder of Anger Management Education and author of Overcoming Destructive Anger: Strategies That Work. Open office plans are a nightmare for highly sensitive people. If it’s not the constant chatter of co-workers, it’s the lack of private personal space where one can think. Too often in such circumstances, we lose focus and concentration and end up struggling to stay awake and simply get through one more day. Have you worked in such situations? I have and found them to be draining and irritating. That being said, most HSPs seem to prefer a balance of office time versus working from home (or other space) time. For me, the ideal arrangement might be 2-3 days in the office (not an open office plan) and 2-3 days of working from home (or other space). How about you? What’s the most sustainable office arrangement for you? The study found that staff that work in an open environment are distracted, irritated and find it difficult to have a good conversation with colleagues. 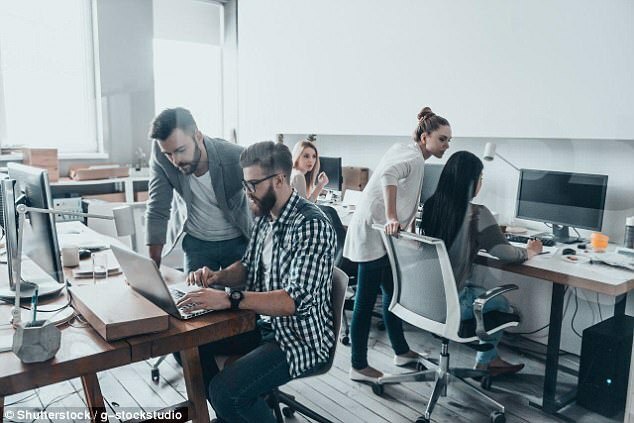 Dr Tobias Otterbring, lead author of the study, said: ‘The results show a negative relationship between the number of co-workers sharing an office and employees’ job satisfaction. The researchers looked at two factors in office workers – ease of interaction with their peers and general well-being. ‘The open plan offices may have short-term financial benefits, but these benefits may be substantially lower than the costs associated with decreased job satisfaction and well-being. ‘Therefore, decision-makers should consider the impact of a given office type on employees rather than focusing solely on cost-effective office layout, flexibility, and productivity,’ Dr Otterbring added. Dr Nicole Millard believes inundation with emails, meetings and other interactions with colleagues are among the chief causes of distraction in large offices. This can lead to ‘task-switching’, which often results in work being overlooked or forgotten. One sign of this is when you shut down your computer at the end of the day and find unclosed windows or unsent emails you didn’t get around to, because you were interrupted. The offices, or ‘coffices’ of the future could be a coffee shop or a hotel lobby, where small teams of workers can meet up to get work done. 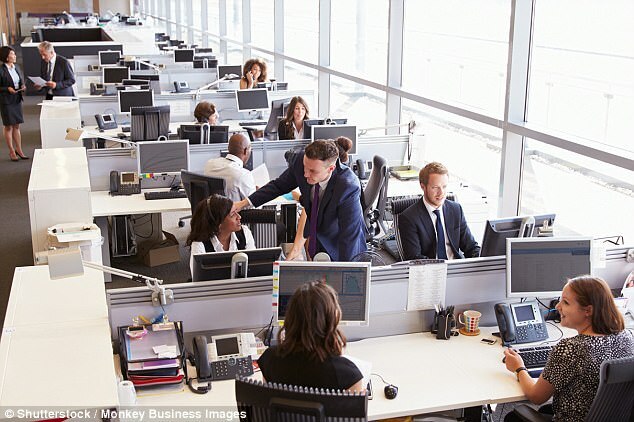 Dr Millard said: ‘The trouble with open plan offices is they are a one-size-fits-all model which actually fits nobody. ‘We’re interrupted every three minutes. It takes us between eight and 20 minutes to get back into that thought process. ‘So we will become shoulder bag workers. Our technology has shrunk so we can literally get our office in a small bag. She added: ‘We need a balance between we and me. ‘We need to give people options of how they can work, such as home working. ‘But I do go a tiny bit nuts if I am just at home, so I think we will start to embrace ‘the coffice’. ‘I need good coffee, connectivity, cake, my WiFi wings to fly me into the cloud.